A National Baseball Hall of Fame career began on this date 56 years ago. The rookie first baseman for the San Francisco Giants got four hits as he led his team to a 7-2 victory over the Philadelphia Phillies on July 30, 1959. Willie McCovey singled in his first big league at bat off Robin Roberts in Seals Stadium and he was on his way to an induction to Cooperstown in 1986. In addition to McCovey and Roberts who was elected to the Hall of Fame in 1976, there were four other future members who played in the contest. McCovey had teammates Willie Mays (1979) and Orlando Cepeda (1999), while Roberts was playing with Richie Ashburn (1995) and Sparky Anderson (2000). After McCovey picked up his initial hit, the 21-year old added another single and a pair of triples off Roberts. 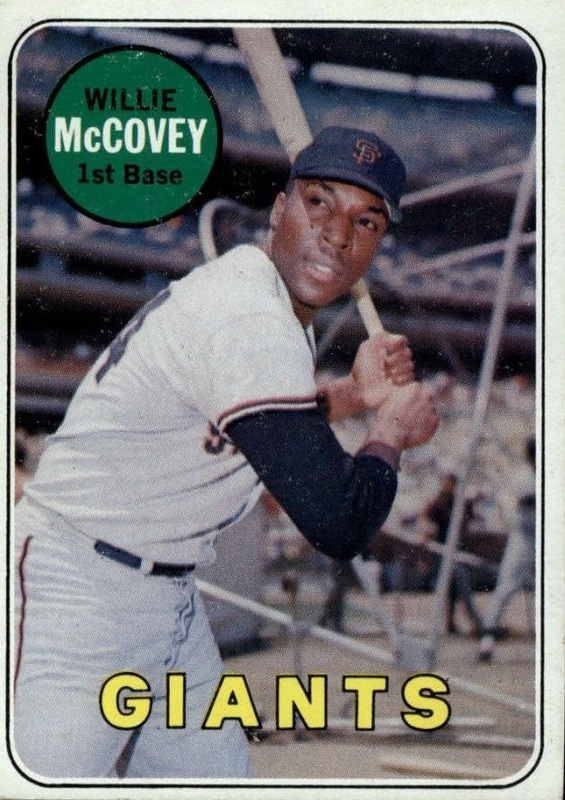 Signed by the New York Giants in 1955, McCovey went on to claim the National League Rookie of the Year award in 1959. A unanimous choice, he finished the season with 13 homers and 38 RBI, while batting .354. McCovey had 521 homers in 22 seasons, which puts him in 19th place on the all-time list with fellow legends Ted Williams and Frank Thomas. A six-time all-star, McCovey had his best season in 1969 when he was named the NL Most Valuable Player. He led the NL with 45 homers and 126 RBI to go with a .320 batting average. He also won NL home run crowns in 1963 with 44 and 1968 with 36. McCovey was traded to the San Diego Padres before the 1974 season. He remained there until he was sold to the Oakland A’s late in the 1976 season. Prior to the 1977 season, McCovey went back to the Giants as a free agent. At 39, he responded with 28 home runs and 86 RBI to win the NL Comeback Player of the Year Award. He finished his distinguished career with the Giants in 1980. The left-handed slugger known as “Stretch” appeared in the post-season twice with the Giants in 1962 and 1971. In the 1962 World Series, he made the final out of game seven on a line drive to Bobby Richardson of the New York Yankees with the winning on base. The Giants fell to the eventual world champion Pittsburgh Pirates in the playoffs in 1971. 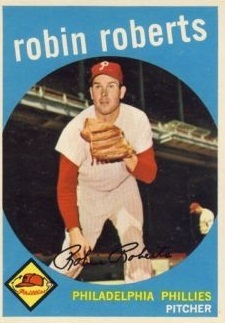 Roberts, who was the losing pitcher for the Phillies that day, was 15-17 in 1959. He finished his 19-year career with a 286-245 record. He won over 20 games six times in his time with the Phillies. A seven-time all-star, he was 28-7 in his best season in 1952. He was with the Phillies from 1948 to 1961. He would end his career in 1966 after stops with the Baltimore Orioles, Houston Astros and Chicago Cubs. 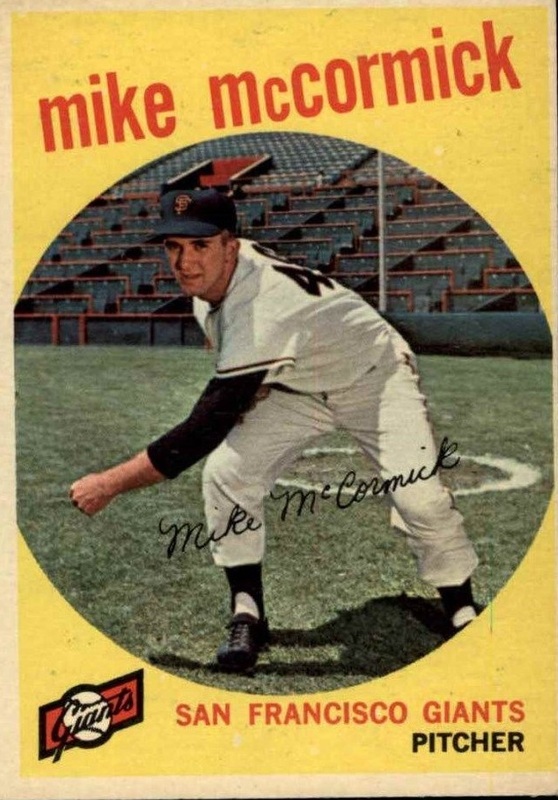 The winning pitcher in McCovey’s first game was Mike McCormick, who won the NL Cy Young Award in 1967. He had a 10-8 record after the contest, but finished the season 12-16 for the Giants as they ended in third place in the NL. McCormick was a two-time all-star that ended his 16-year career with a 134-128 record. He was with the Giants from 1956 to 1962. He then went to the Baltimore Orioles (1963-1964) and the Washington Senators (1965-1966) before returning to San Francisco. In 1967, he was 22-10 as he became the top pitcher in the NL. During the 1970 season he was traded to the New York Yankees. His last appearance in the majors was with Kansas City in 1971.